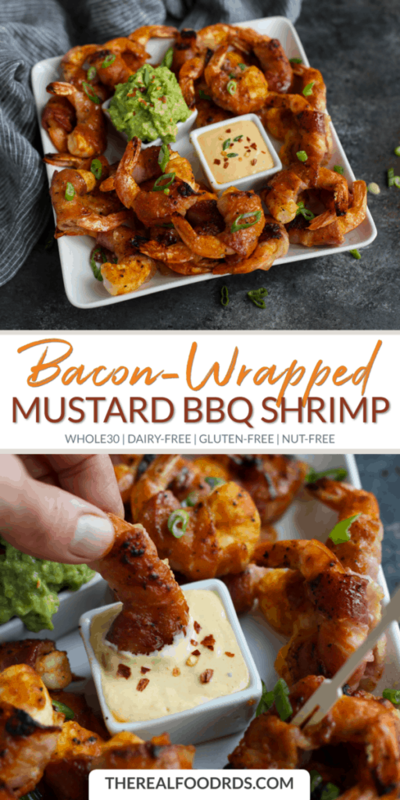 Appetizer season (aka football season) is wrapping up, but don’t let that stop you from replaying these Bacon-Wrapped Mustard BBQ Shimp over and over again in the off season. I’m just here for the food. I am not a football fan. Not even a little. Just the sight of a football game makes me want to walk out of the room. I even married a man who doesn’t like football so I wouldn’t have to watch it. Sounds extreme, I know, but it’s true. Now, that’s not to say that there’s anything wrong with football if you love it – it’s just not my jam. But I am pretty keen on the idea of football food – like Buffalo wings, guacamole, and saucy meatballs you can stab with toothpicks. 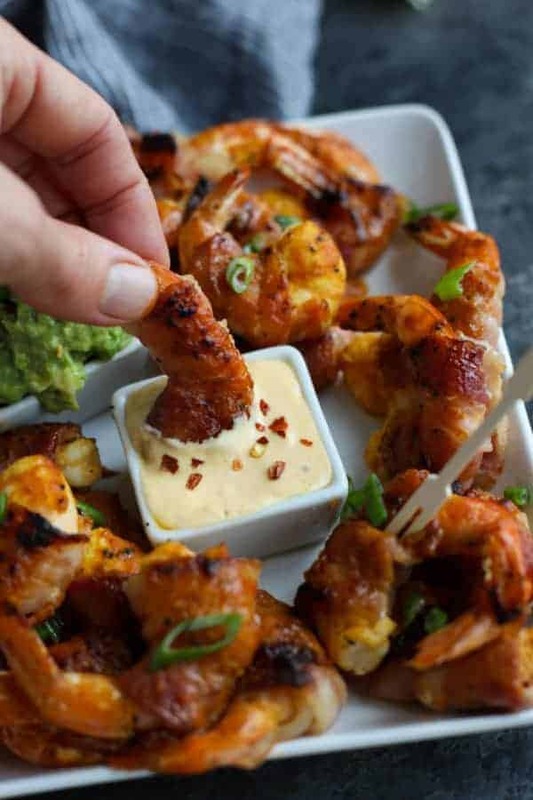 And I’m definitely down with these Bacon-Wrapped Mustard BBQ Shrimp, which are perfect for game-day gatherings or any other time you might want an incredibly delicious and hearty appetizer (read: any time you get together with friends and family). So now that I’ve got that off my chest… Let’s talk about these salty-savory-tangy bits of bite-sized deliciousness. Wrapping bacon around anything instantly elevates it from good to great, wouldn’t you agree? 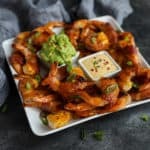 Yes, yes you would otherwise you wouldn’t be reading a post about Bacon-Wrapped Mustard BBQ Shrimp in your search for the perfect party appetizer or show-stopping game day snack. Don’t be intimidated about the bacon-wrapping part. Shrimp are easy to wrap if you follow two simple rules: 1.) You pat them very dry with a paper towel so you don’t water down the tasty sauce, and 2.) You wrap just the meaty end of the shrimp and not the tail. 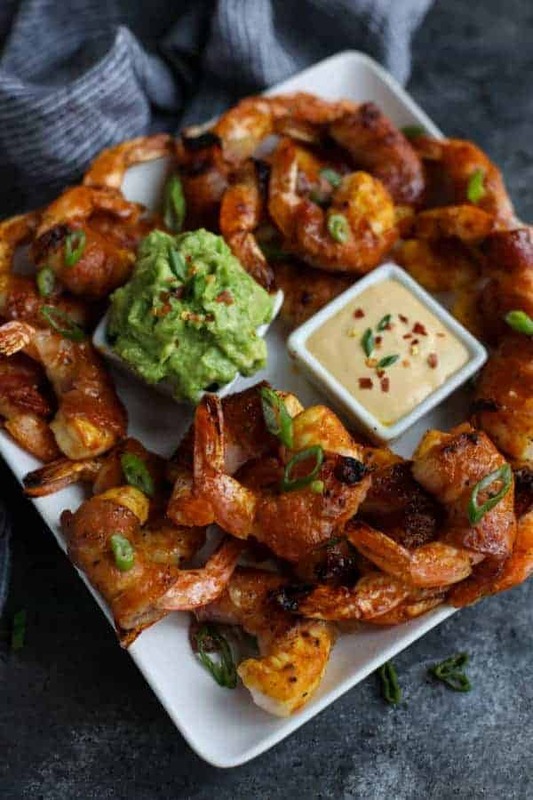 You want to let the tail hang out so you have something to grab onto when it’s time to do some dipping in your favorite guacamole or simple “aioli” made by stirring together a little mayonnaise with mustard BBQ sauce as I did here. 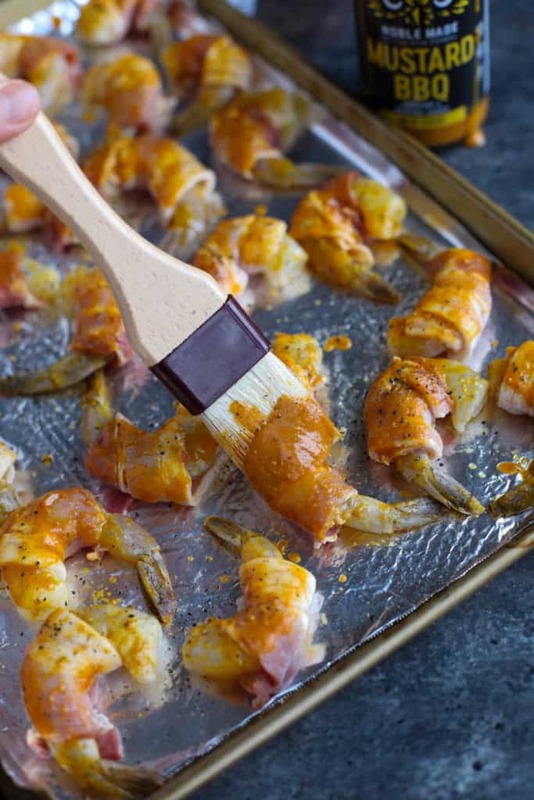 I didn’t mention the sauce yet, but let’s talk about dat sauce because it’s what makes these Bacon-Wrapped Mustard BBQ Shrimp anything but ordinary. 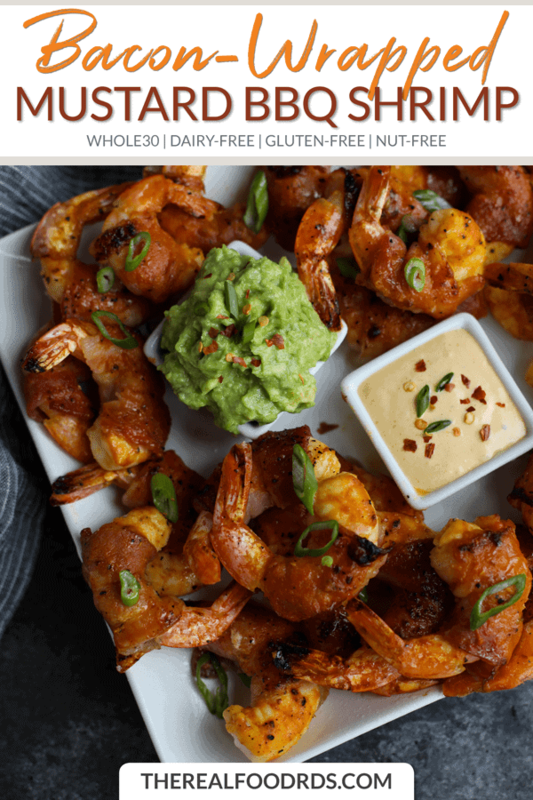 To give them the perfect tang with just a hint of sweetness (from pineapple juice and tamarind concentrate), you’ll send the shrimp off for a quick dip in the The New Primal’s Mustard BBQ Cooking and Dipping Sauce – kind of like marinating only there’s no waiting – while you line a rimmed baking sheet with foil and cut the bacon into smaller pieces. Then it’s just wrap, broil, and enjoy – all in under 30 minutes if you play your game right. For all of you fellow barbecue sauce lovers, let me just say that this Mustard BBQ Cooking & Dipping Sauce is like none other. 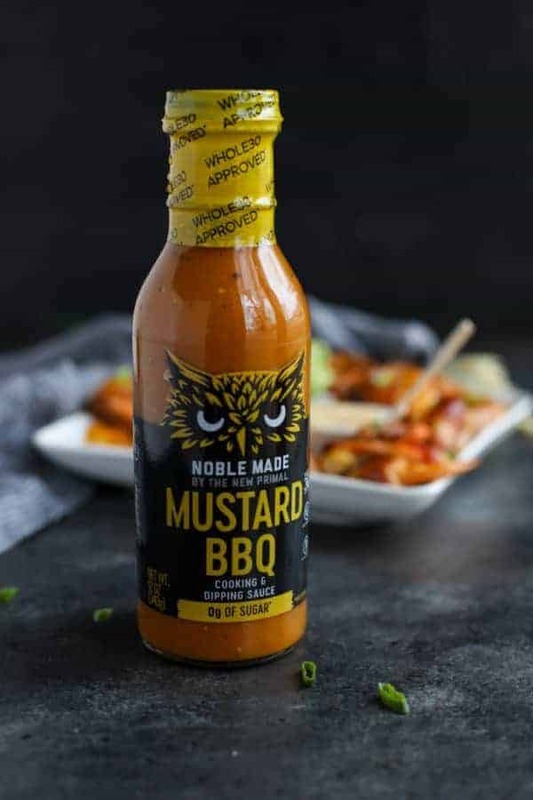 As the folks at The New Primal say, it’s their “wink and nod to their home base – the Carolinas” – which if you know barbecue, you’ll know that means a tangy golden sauce with bright turmeric, zingy apple cider vinegar and plenty of mustard for a bold flavor with just a bit of heat. 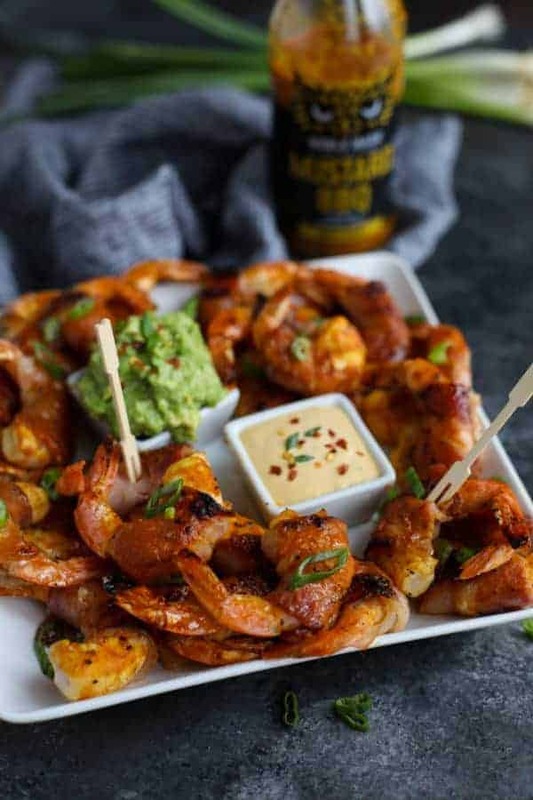 Whether it’s the Super Bowl, a college game, a Friday night gathering with friends or the holidays, these Bacon-Wrapped Mustard BBQ Shrimp are sure to score some serious points with everyone – no matter which team they’re rooting for. Preheat broiler to medium-high heat (about 375-400℉). Position the top oven rack so that it’s in the upper 1/3 of the oven (about 8 inches from the broiler). Line a large rimmed baking sheet with foil then spray with oil spray (such as Primal Kitchen Avocado Oil Spray). 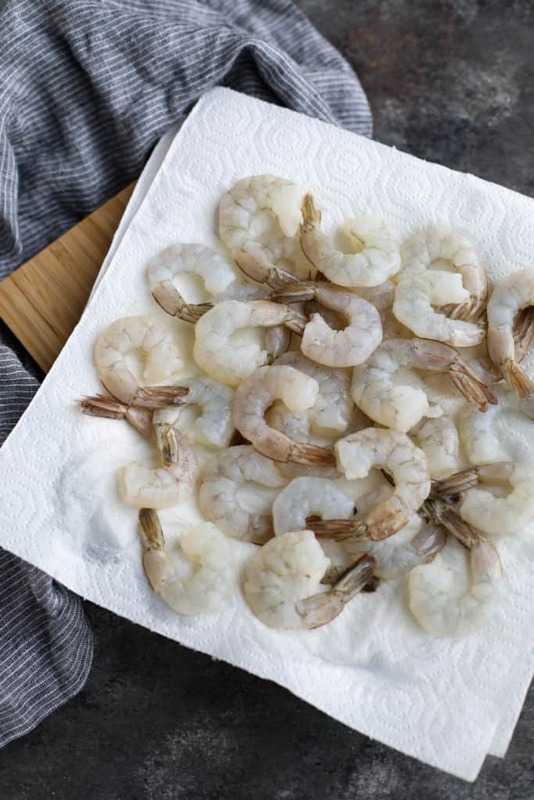 Pat shrimp dry with a paper towel to remove excess water or dampness. Place in a shallow dish. 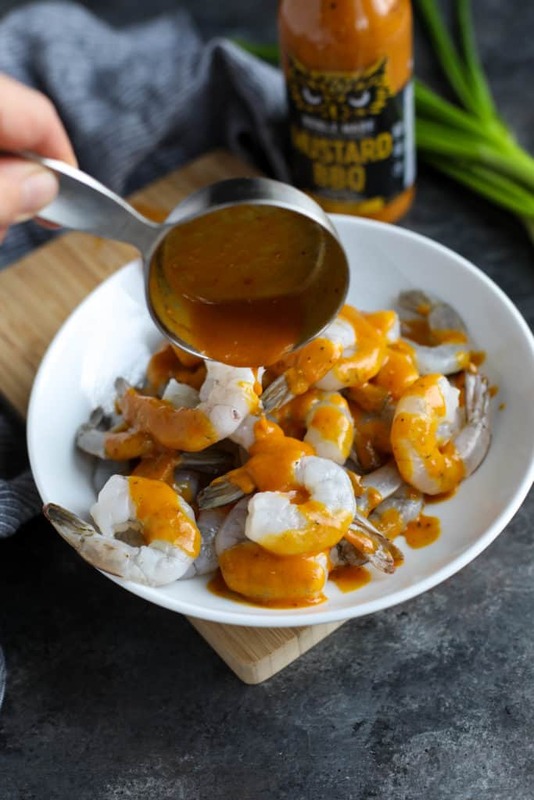 Add 1/3 cup The New Primal Mustard BBQ Cooking & Dipping Sauce to shrimp and toss to coat. Set aside. Cut each bacon slice into thirds. 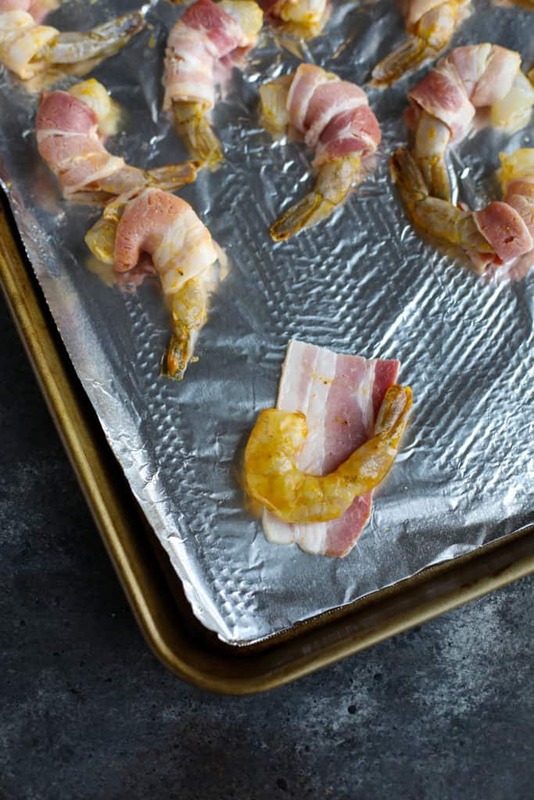 Wrap a slice of bacon around each shrimp and place seam-side down. You may choose to secure the bacon with a toothpick if desired. 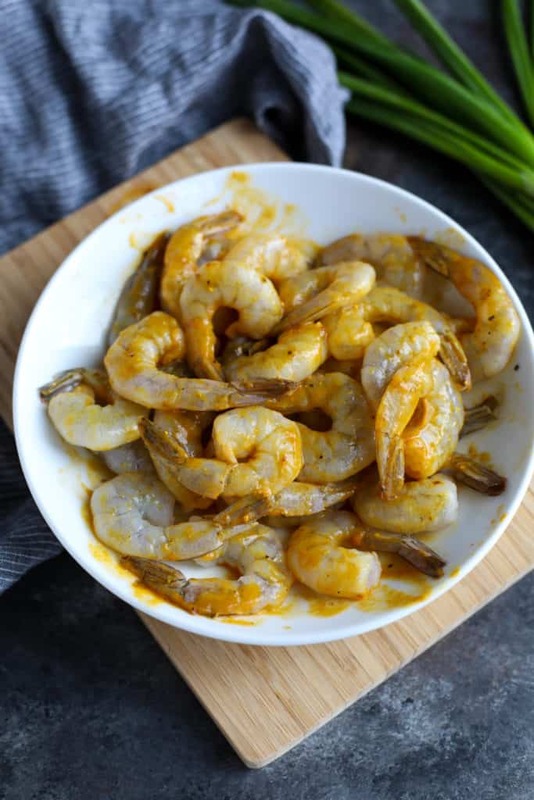 Brush shrimp with remaining mustard BBQ sauce, then sprinkle with cracked black pepper. 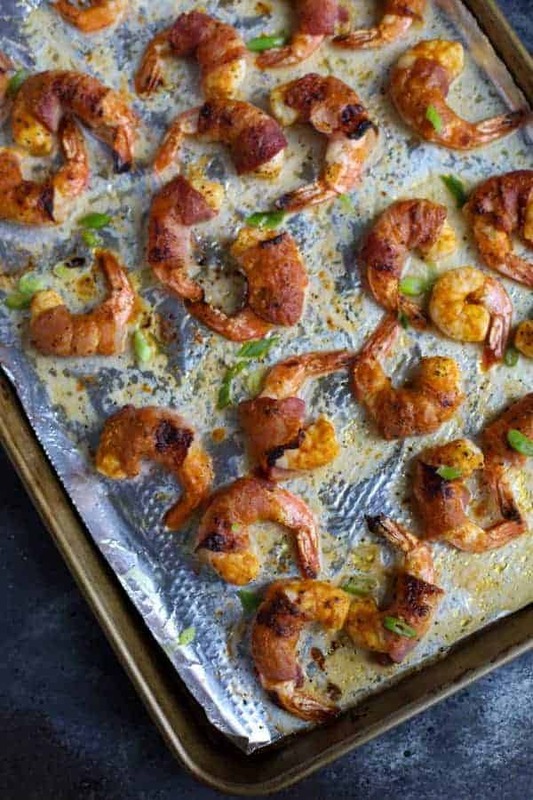 Place shrimp in an even layer on the prepared baking sheet and place under broiler. 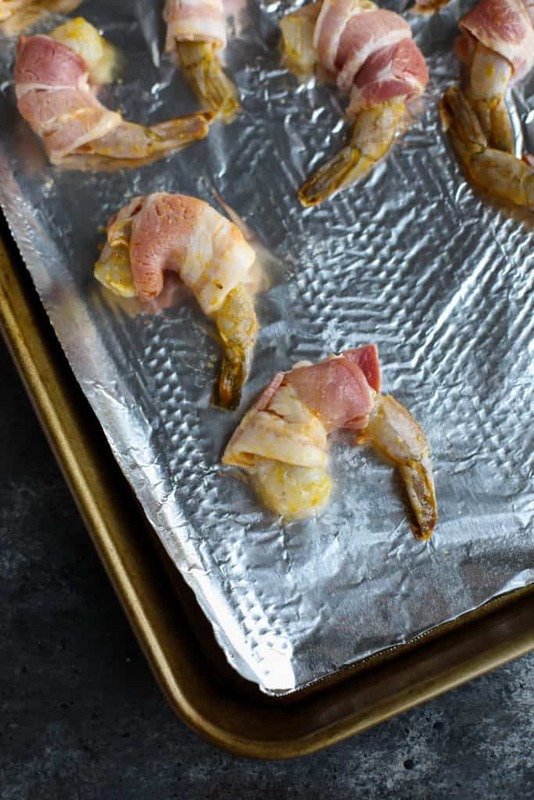 Broil for 4 minutes, then remove the pan from oven, carefully flip shrimp the return to oven for an additional 4-5 minutes or until bacon and shrimp are both cooked through (being careful not to overcook the shrimp). Remove pan from oven, transfer to a plate and serve with mustard-mayo, additional mustard BBQ sauce or guacamole, if desired. What’s your favorite game day appetizer? We want to know – share in the comments below! Pin in now & make it later! This post was made possible by our friends at The New Primal. Although we received compensation for this post, the opinions expressed here are – as always – 100% our own. Thank you for supporting the great companies we work with thereby allowing us to continue creating great recipes and content for you.